12" A/O Sanding Disc, 80 Grit PSA, 2 pk. Woodstock - 12" A/O Sanding Disc, 80 Grit PSA, 2 pk. 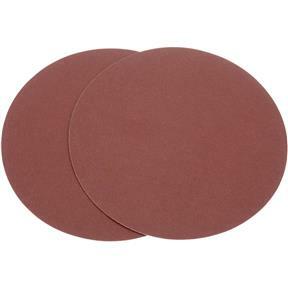 These 12" diameter 80 grit aluminum oxide sanding discs are sized to fit most common disc sanders and are sold in a 2 pk. These sanding discs are pre-applied with top-quality pressure sensitive adhesive. These are great quality and I am very pleased with the product. I recently purchased this sander. The sanding performance has been excellent. It has very adequate power and runs smoothly. My one concern has been access to the aluminum disc when changing sanding discs. It took me nearly 40 minutes to change from a coarse to a medium grit. It seems as though there is a basic engineering problem in the access to change sanding discs. So far I love it. I have only had this about a month. Grizzly asked for this review. This is why i am giving it so early. It is a great sander so far. I burned up 4 sears craftsman sanders in 3 years.They were the best one Sears offered, with a life time guarantee. However I got tired of having to use the guarantee, so i bought this. If it lasts, it will be a five star unit. That being said, It seems like it will, no bogging down no matter what I throw at it. I have confidence in this machine, I purchased a Spindle sander about 4 years ago and love it. This is what convinced me to try the Grizzly sander. I purchased the D1336 Sanding Disks about 2 weeks ago and am extremely satisfied with the quality and delivery time.